If you are searching for a cheap rental car in Kelowna, VroomVroomVroom allows visitors to compare deals from leading car suppliers, including Budget, Enterprise, Avis, and Budget. Simply fill in the search form above with complete information to begin comparing the best car hire rates. The name of the city, Kelowna, comes from the Okanagan language and means "grizzly bear". It was settled by a catholic missionary, the French Charles M. Pandosy. He initially named the new settlement L'Anse Au Sable, the French for "Bay of Sand". In 1905, the city was incorporated as Kelowna. Why rent a car in Kelowna with VroomVroomVroom? Below are other reasons why you should book a car rental with us. Great rates. Our Price Promise assures you of getting a good deal. Fast and Easy. With our quick and simple car rental booking system, you can have a rental car completely booked and confirmed within two minutes. Wide selection of cars: Whether you need an economy car or an SUV, you can easily find it in our list of rental cars. Trusted since 2001. We are the experts in rental cars. Our friendly and committed customer care experts are ready to help, so feel free to contact us via phone, email or live chat. Kelowna or K-Town, with its motto "Fruitful in Unity" is located in the regional district of Central Okanagan, in British Columbia, Canada. Kelowna is in the Okanagan Valley, along the Okanagan Lake. Planning to visit the Okanagan during the winter? Note that Okanagan BC roads can be very dangerous, as the weather (one minute it's raining and the next minute there's a snow storm) and road conditions differ greatly from the valley bottom to the higher mountain roads. Also, smoking within all Kelowna parks is restricted, including in parking lots, playgrounds and beaches. Weather-wise, the perfect time to visit Kelowna is during winter ( between November and February), as it gets mildly cold during this time. While late spring and early fall is the most appropriate time to savor a multitude of bold activities this city has to offer. Typically, summer lasts from April to May followed by the falls. VroomVroomVroom wants to make your holiday in Kelowna more fun that's why we have listed some attractions that you should not miss in your trip. With a reliable car rental, you can easily get around the area. Always wanted to try flyboarding? But no one to go with? HydroFly Kelowna got your covered! Founded by professional Hydroflight Athlete Michael Prince in 2015, HydroFly Kelowna is a family owned and operated business with over 2,000 happy customers and counting. Whether you want to jump in solo or bring a friend, this flyboard experience is suited for anyone looking to learn this fun sport. Mike and his team have grown a vast knowledge and expertise at teaching others. Their close knit team invites you to bring your family/friends and come challenge yourself as a group, or as a party of one to experience with new found friends. With 25 minutes of fly time each, you will be on the boat from one hour, up to 2.5 hours depending on how many are in the group. What are you waiting for? 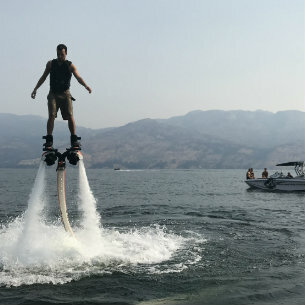 Book now at HydroFly Kelowna and experience the thrill of flyboarding. The beautiful waters and views of the Okanagan await you! Apple Bowl is a multi purpose stadium located at 1555 Burtch Road. It has a surface of natural grass and a 400 meters rubber track. The stadium offers seating for more than 2,000 people. If you travel to Kelowna, you should visit this great attraction of the city, the host of many important community events. Kelowna Art Gallery was opened to visitors in 1976. This is the most important public art gallery in the region and has a permanent collection of Irvine Adams. This Kelowna attraction has over 700 works of art exposed. A part of the paintings and sculptures were bought and a part were donated. Each year, wonderful temporary collections are exhibited in the gallery, attracting thousand of visitors to Kelowna. Center of Gravity is an important sport event of Kelowna. It is held each year in a prolonged weekend of August. It includes besides sports competitions, free live music concerts. This Kelowna festival includes beach volleyball, basketball, freestyle mountain biking, wakeboarding and FMX. In the last year, this single event has drawn more than 25,000 participants. Budget Kelowna - 2702 Highway 97 North, Kelowna, BC. Enterprise Kelowna - 1517 Keehn Road , Kelowna, BC.